We can bring our hidden hurts to God because He already knows about them. He knows when we avoid dealing with our pain. God is patient and willing to wait until we grow to accept His unmerited grace to cope with it. God’s knowledge of our hidden hurts can encourage us as we know that He will take care of us. Healing is possible because God knows when no one else does. “…God is love. This is how God showed his love among us: He sent his one and only Son into the world that we might live through him. This is love: not that we loved God, but that he loved us and sent his Son as an atoning sacrifice for our sins” (1 John 4:8-10). The love of God is greater than the pain of our hidden hurts. His unconditional love interweaves through our past, present, and future hurts to give us comfort and peace. We have to be willing to embrace His love if we are to get beyond the pain of the past. There’s a confidence that rises in our hearts when we experience God’s love. Healing is possible because God cares even when we can make ourselves care enough. “And my God will meet all your needs according to the riches of his glory in Christ Jesus” (Philippians 4:19). Many of our hidden hurts are due to lack of something—whether lack of love, trust, peace, or comfort. The Lord provides whatever we need to overcome hidden hurts. He can bring what no one else could provide due to their finite abilities. Our trust is in the all-powerful God to do above and beyond what we could ask or imagine. Healing is possible because God provides everything we need to move forward. “Jerusalem, Jerusalem, you who kill the prophets and stone those sent to you, how often I have longed to gather your children together, as a hen gathers her chicks under her wings, and you were not willing” (Luke 13:34). The God we serve isn’t some cosmic, unfeeling force in heaven. He is a loving Father who desires nothing but the best for His children. He wants each of us to succeed in this life and He knows we can’t have success while carrying the baggage of hidden pain. Healing is possible because God desires the good things for our lives. “Lord my God, I called to you for help, and you healed me” (Psalm 30:2). Much of our hidden pain is due to incomplete spiritual, emotional, and physical healing. The Lord we serve is the greatest Doctor and He can heal us in ways we could’ve never imagined. We must pray and seek His healing touch for our hidden hurts. Healing is possible because God heals in His perfect way and timing. “Thanks be to God, who delivers me through Jesus Christ our Lord!” (Romans 7:25). Many times we have hidden hurts because of our own bad decisions. We can feel trapped by the consequences of our sins and the enemy continues to hold us captive in our minds. However, we can be set free because God delivers His people as they cry out to Him. 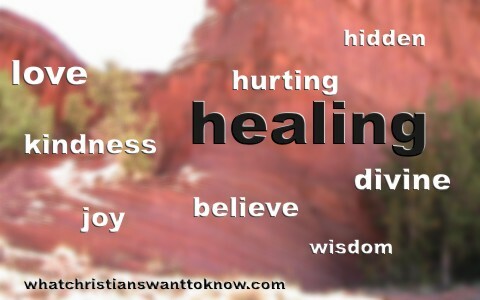 Healing is possible because God delivers those who submit to Him with a pure heart. Our hidden hurts aren’t really hidden at all. Not only are they evident to God, but also to those who live or work around us will sense the brokenness within our hearts. We can first make sure that we are seeking God’s forgiveness and put our hope in Him regardless of the situation. God is more than able to heal our hurts and present us spotless to His Son. Previous post: How Does The Bible Define Courage?